India women’s cricket team launched their campaign at the ICC Women’s World Cup with a comfortable 35-run win over England, riding on superb batting display by the top-order on Saturday. Mandhana was a last-minute inclusion to the squad after she recovered from an Anterior Crucial Ligament (ACL) injury she suffered during the Women’s Big Bash in January. The 20-year-old during her whirlwind effort showed what she was worth the selection. She was majorly responsible for giving India a flying start as the team reached 59 in 10 overs. 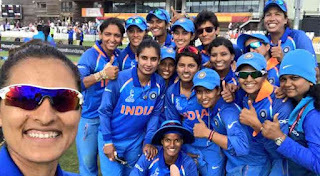 Captain Raj then joined Raut in the middle and carried on with her rich vein of form to take India to a competitive total.